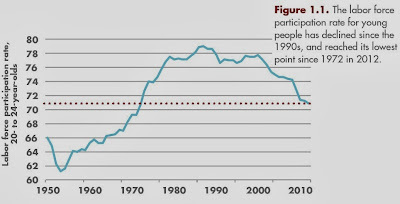 Andrew R. Hanson, and Artem Gulish explore these issues in their report Failure to Launch: Structural Shift and the New Lost Generation, a September 2013 report from the Georgetown Public Policy Institute. Here are a few of the figures that jumped out at me. The proportion of young people in the labor market is dropping, while the share of older people int he labor market is rising. 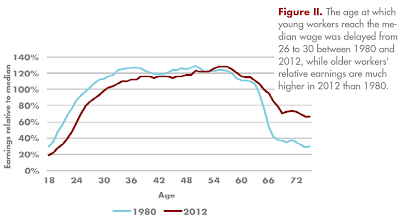 This figure shows that back in 1980, about 50% of all 18 year-olds were in the labor market; by 2012, it was about 30%. 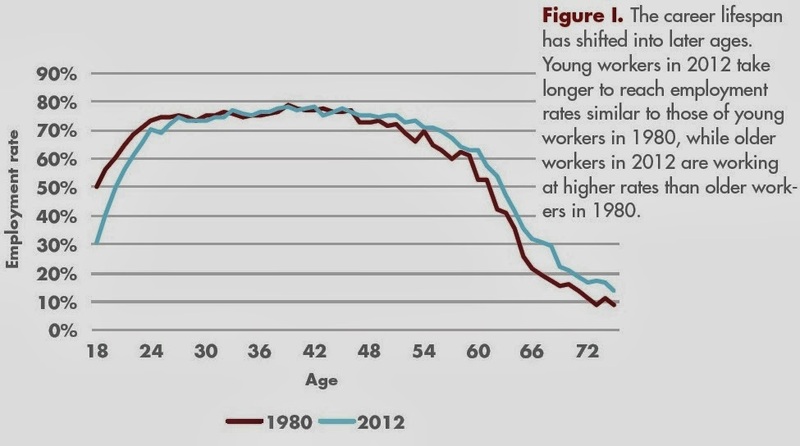 However, those in their 50s, 60s, and older are more likely to be in the labor market than they were in 1980. 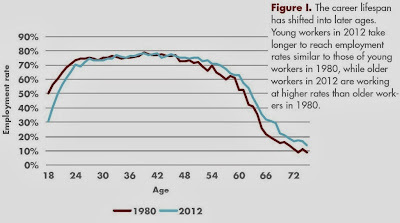 In fact, the share of young people in the labor market has fallen to a 40-year low. While the decline has been especially pronounced in recent years, it clearly dates back several decades. The usual explanation is a combination of a positive and a negative factor. The positive factor is that more young people are attending colleges and universities, and so are not in the labor force in their early 20s. The negative factor is that the kinds of jobs that were were available to those without a college degree back in the 1960s and 1970s--blue-collar jobs with significant skills that offered the prospect of lifelong economic advancement--have become increasingly scarce. 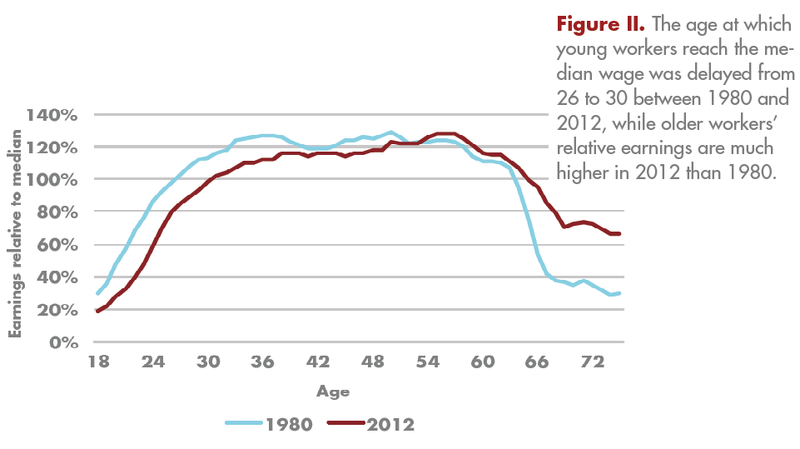 Today's young adults are getting a slower start on adult life. I As a result, it is taking young people longer to start climbing the career ladder. This graph shows the earnings of someone at each age level compared to median earnings, for 1980 and for 2012. In 1980, for example the typical 18 year-old had earnings that were about one-quarter of the median income, but the typical 26 year-old had earnings that were equal to the median income. 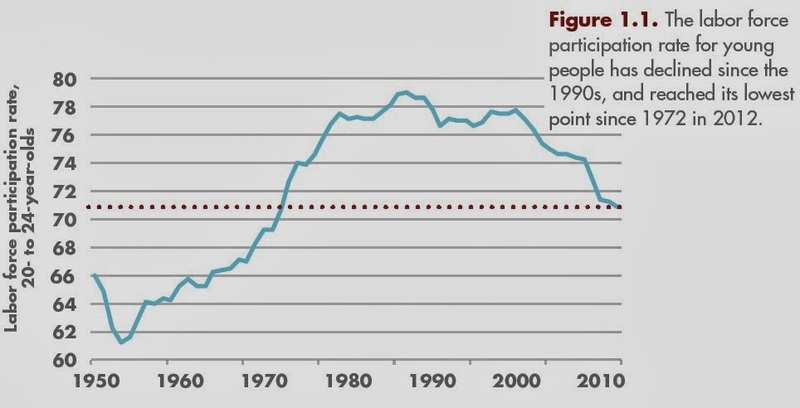 However, in 1980 earnings dropped off quite sharply when people reached their early 60s. In 2012, the typical workers reach the median level of earnings until age 30--four years later than their counterparts in 1980.And in 2012, while wages still drop off when people reach their early 60s, the decline is not as rapid or as far. And of course, a later start on careers is also one of the reasons why people are getting married later and starting families later. Carnevale, Hanson, and Gulish write: " Evolving social norms entangled with economic hardships have led young people to delay household and family formation. Two-thirds of young adults in their 20s cohabitate; the average age of marriage increased from 21 to 26 for women and 23 to 28 for men between 1970 and 2006. Over the same period, the average age of a mother at the birth of her first child increased from 21 to 25. In 1960, three out of four women and two out of three men completed school, left home, achieved financial independence, were married and had children by age 30. In 2000, less than half of women and only one-third of men reached the same milestones by age 30." There is a lot to be said for marrying and having children a little later in life. I married at age 30 and had my first child at age 37. But when I visit with friends my age whose children have already graduate from college, or when I coach youth soccer games on creaky knees, I recognize that a slower takeoff to adulthood has its tradeoffs, too.